Ever since the Olympics, J and I have been looking forward to the USA Curling Nationals at Wings Stadium. We didn’t know which day we would go, but we wanted to go to one draw. Today turned out to be the day. There was an afternoon draw at 2:30 so that gave us time to grab lunch and go watching some curling. The initial plan was to eat lunch at The Icehouse, but once we got to Wings Stadium, we couldn’t actually find it. We went into the Annex, but that’s where the signs for it stopped. It was dark in there, so we assumed it was closed. We headed around to the box office, got our tickets and figured we’d just eat concession stand food again, but as we tried to walk in to the arena, we were stopped and told gates didn’t open until 2:00. It was a little before 1:30, so we just left and went to eat. From Wings Stadium, I headed down the road back towards Sprinkle. 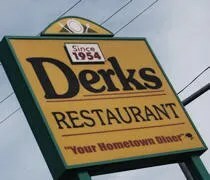 Right on the corner of Sprinkle and Vanrick Drive is Derks Restaurant. Seemed a logical choice. 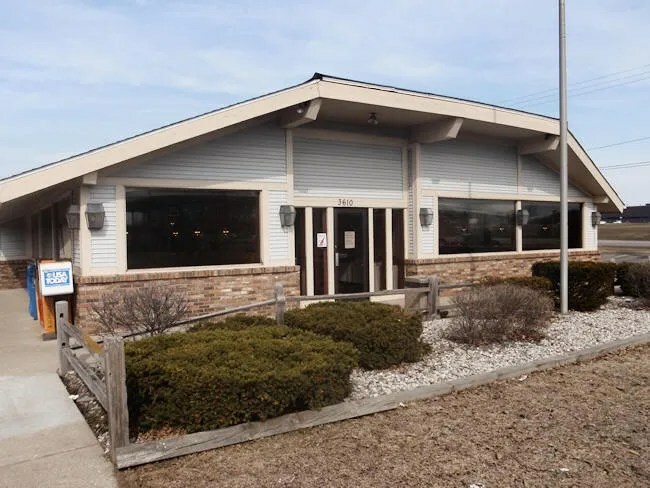 We were just looking for a quick, cheap meal and what better place to find one that an old family restaurant that has been in business since the 1950’s. This is actually one of what used to be two Derks locations. There was a second Derks in Portage, but that was torn down some time ago to make room for a the Main Street Pub on Westnedge. The entrance to the building is on the Vanrick Drive side, but parking is along the side. I noticed quite a few other people with USA Curling credentials around there neck, so we weren’t the only ones to come up with this idea. When we walked in, a waitress told us to sit wherever. The restaurant is completely non-smoking, so that wasn’t an issue. We took a seat in a booth in the larger dining room. We were brought menus and drinks right away, but then service dropped off severely. We weren’t quite ready to order when our drinks came, but we waited another ten to fifteen minutes for our waitress to finally come back. It was only 1:30, but she already seemed more preoccupied with cleaning up for the 3:00 closing than taking care of us. I turned around to find her sweeping the floor and cleaning coffee pots while we sat there making tents out of our menus. I spotted a McDonalds just down the street as I looked out the window and I was very tempted to get up and walk. The waitress finally did come back and we were able to put in our orders. The menu is pretty standard diner fare. They do breakfast all day which seems to be their bread and butter. The breakfast menu is much larger than the lunch menu. I went with the Derkburg which is two five ounce burger patties separated by Cheddar cheese and served on a toasted bun. The sandwiches come with chips, but I upgraded to fries. After putting the order in, a different waitress brought the food to our table and it came out really quick. It actually took less time to get the food than it did for us to put the order in. The burger looked to be fresh hamburger, but it was way overdone. 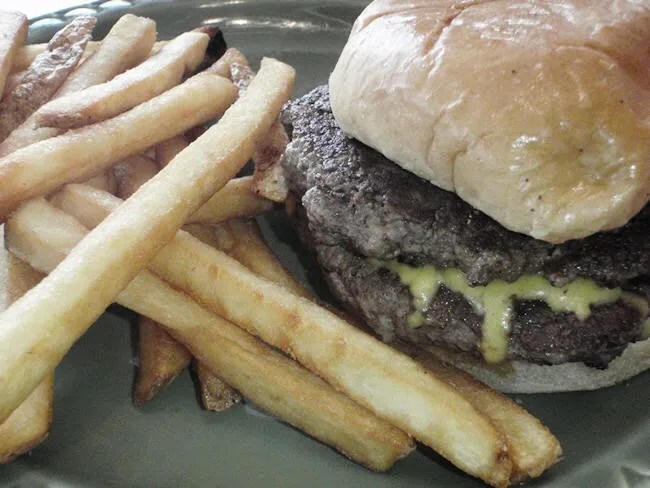 In typical diner fashion, the burger was cooked well-done which leaves it dry. Still, it was a substantial sandwich and better than a frozen patty burger than I was expecting. The fries were skin-on fries and done perfectly. They were nice and crispy on the outside and done well on the inside. I appreciate the parts of the burger (the fresh meat, toasted bun), but it was a little too done for me. As far as diner food goes, it was pretty good though. 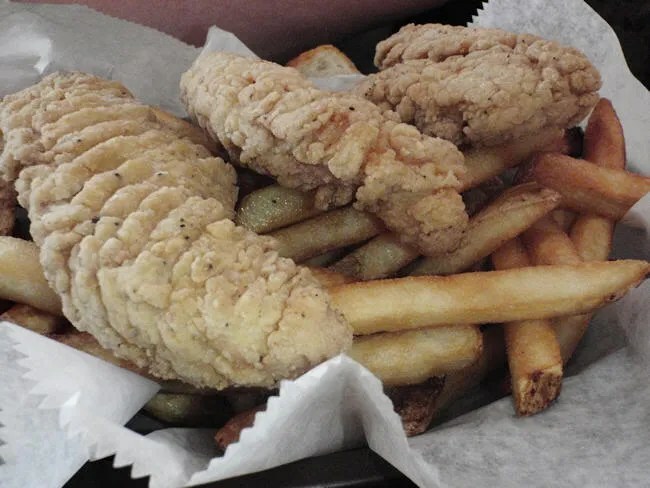 J ordered the Chicken Finger basket which came with three chicken fingers, fries, two slices of Texas toast and applesauce. The chicken was pretty good, but probably nothing more than the standard GFS chicken strip. She got a lot of fries with her meal and ended up sharing. She really liked pretty much everything on her plate. The fries were cooked the way she likes them and the chicken strips were a pretty good size. During the meal, the original waitress came and dropped the check off without saying anything. I pulled me credit card out and set it on the bill right away. We finished eating and I his the restroom yet the check was never picked up. I saw her take someone else’s credit card over to the machine to run it, so I just got up and brought it over there myself. No sense in watching the staff clean up around us even though there was still an hour until closing time. The total was a little over $16 and neither of us left hungry. As far as the food goes, it’s pretty good diner fare. The service today was a different story. Lucky for us, we weren’t in a huge hurry because if we were, we would have been screwed. That’s interesting, since I’ve never had bad service there and always a good experience. That being said, I’ve only been there twice, both closer to breakfast, and it’s perhaps not worth going across town for. yeah..I was surprised, but they were definitely paying more attention to cleaning for closing the day we stopped in.